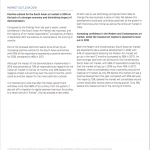 ArtTactic is delighted to launch the second edition of the South Asian Art Market Report 2018 in partnership with Rawlinson & Hunter and W/R/B Underwriting. 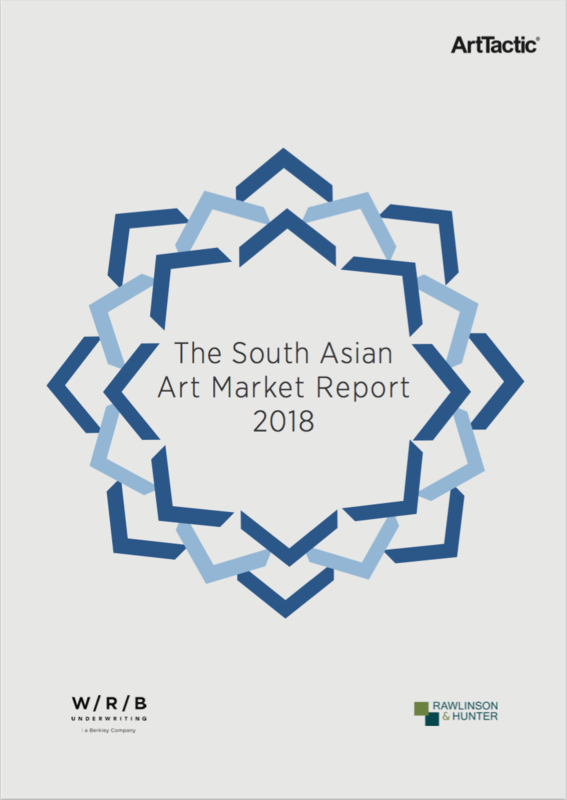 Following on from last year’s inaugural South Asian Art Market report, which set out to analyse the evolving South Asian art market eco-system and the growing number of non-commercial initiatives over the last 10 years. 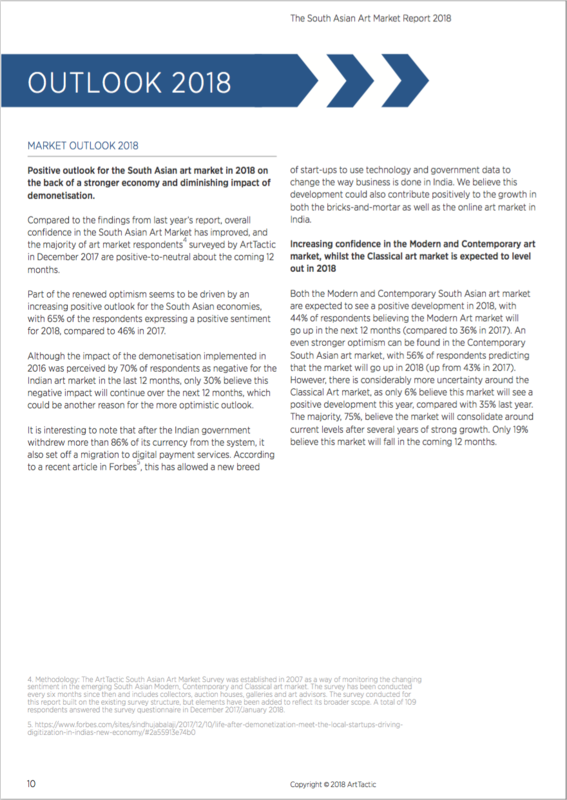 This year’s edition is primarily focusing on the South Asian gallery sector, particularly looking at sales levels, average prices, analysis of different sales channels, including art fairs and online sales. The survey conducted among galleries also highlights some of the key challenges facing the sector and suggestions for how these challenges might be addressed. This year’s report presents a unique insight into a sector, where very little pre-existing data exists, and offer an alternative view of the South Asian art market seen through the eyes of the galleries. 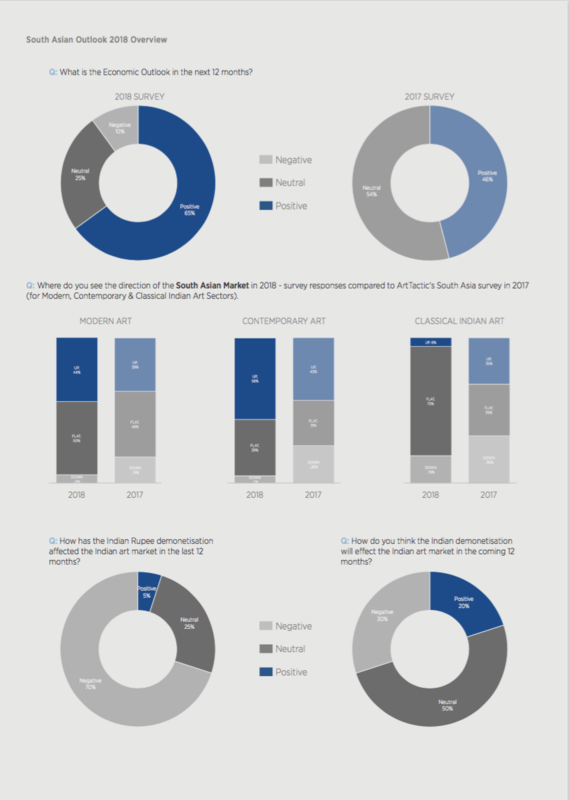 South Asian art market up 13% in 2017: South Asian art market sales were conservatively estimated at $223 million in 2017, up an estimated 13% from 2016. 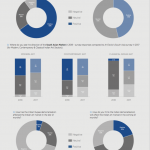 Gallery sales reach $104.5 million in 2017: Total sales by South Asian galleries was estimated to be $104.5 million in 2017, which account for approximately 47% of the total South Asian art market sales. Indian gallery sales accounted for an estimated $81.1 million, with the remaining $23.4 million coming from the rest of the South Asian region. Gallery sales were up 8% on average in 2017. Auction sales generated $118.2 million, up 17.1% in 2017: The South Asian auction market saw total sales of $118.2 million3, with $48.2 million sold by Indian auction houses (up 1.3% from 2016). Global auction sales of South Asian art were up 17.1% from 2016. South Asian art market sales were conservatively estimated at $223 million in 2017, up an estimated 13% from 2016.